How often do you find yourself pulled in opposite directions from what you need to get done at work versus sustaining your basic bodily needs? If the answer is 'often', it might be a sign your work-life balance is disturbed. Work-life balance refers to making space in your life outside of your profession in order to keep your body and mind operating smoothly. Such a balance is necessary not only to remain healthy and in homeostasis, but also to run your business with a clear mind and sustainable energy. 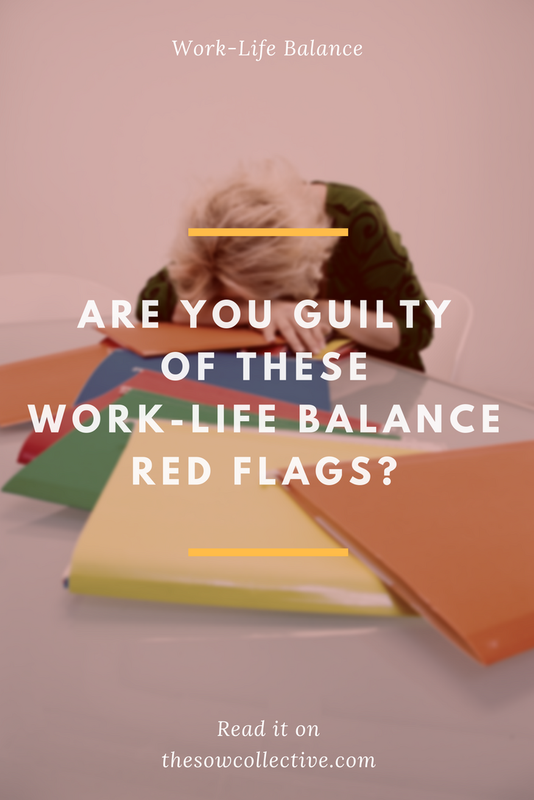 Have you noticed these red flags? 1. You forget to eat throughout the day. Forgetting to eat doesn't just mean spending most of the day skipping meals. It can also mean choosing unhealthy options and/or the wrong meal portions. 2. You're unable to make time for physical exercise (or don’t feel it’s a priority). Either way your health is suffering because of it. Skipping exercise can cause weight gain, chronic disease, or even affect your mental health. 3. You find yourself overindulging in addictive substances. To unplug from the stress of work you may find you reach for addictive substances like sugar, carbs, alcohol, or recreational drugs more often. This temporary bliss often comes with adverse effects. 4. You have no space in your schedule to spend time with loved ones. Committing to engagements may feel draining when there is an imbalance between personal life and work. Perhaps you feel these red flags are normal -- it's how everyone copes, right? Just because many people are attached to these habits doesn’t mean it’s healthy or a sustainable way to live. If the scales are tipped and our work becomes something that robs us of balance elsewhere in our life, it’s time to do a bit of adjusting. 1. Eat at least 3 meals each day (and healthy snacks along the way). Be sure to eat consistently throughout the day as well as away from your desk or place of work. Realistically, we don’t have time to hand-make all our meals, but we can be thoughtful about what we’re eating. Making space to think ahead about how we can fuel ourselves with whole foods is both an act of self-care and productivity boost. If our tank is empty, our brain power will diminish. Let’s face it, using technology to complete our work is a given. We must use it for work, business marketing, blogging, and research. That’s why it’s imperative to create boundaries for yourself and your exposure to electronics. If possible, have the first and last 30 minutes of your day exclude any type of screen. Look forward to more restful sleep and a more peaceful start to your day. 3. Make connection a priority. Our bodies crave connection; it’s imperative for mental health. Make space every week to set aside work and experience the healing power of human connection. Find a hobby that you can share with someone. Call a friend to unwind with after work. Create space for you to get lost in friendship or conversation. This is the perfect way to decompress and break up the mental grind that results from focusing all day. One major reason why our work-life balance gets thwarted is because we feel a strong desire to please others over our own needs. Despite feeling stressed from work, notice how often you say yes to projects and commitments you know will you push you over the edge. Creating boundaries encourages you to communicate and honor whole body wellness. Remember: a healthy work-life balance positively affects our wellness, personal life, and performance at work. When the body is fueled and well-rested, we become more creative, energetic, and ready to take on the challenges that each day may bring to us. About the author: Natalie Gaetani is an Integrative Nutrition Health Coach helping young women find digestive relief through mental, physical, and spiritual growth. Read more holistic wellness tips at www.nataliegaetani.com.